Residents at YMCA Surbiton are now teaching each other to cook with a cooking club in their new communal kitchens. With the refurbishment of YMCA Surbiton, hostel rooms have been upgraded and modernised with ensuite bathrooms giving the place a whole new feel. In a bid to encourage residents to become less institutionalised and more independent, communal kitchens have been built on each landing. This aim for independence is pre-requisite of the government’s Supported People Grant which is held by Kingston Council. YMCA Surbiton is commissioned by the council to deliver a service for vulnerable people, and people must feel empowered, independent and look to the future to support themselves. The challenge has been getting many of the residents into the kitchen, learning how to cook healthily, shopping, and managing budgets. This hasn’t been plain sailing, as some residents have never cooked for themselves, or haven’t had the ability to do so because they were homeless or have been living in less than ideal home situations. Back in January, the Community Activities Team ran a six-week workshop called Cook and Eat, but found it was difficult to get people to commit for the full six weeks, especially if they were studying or working, or looking for work. 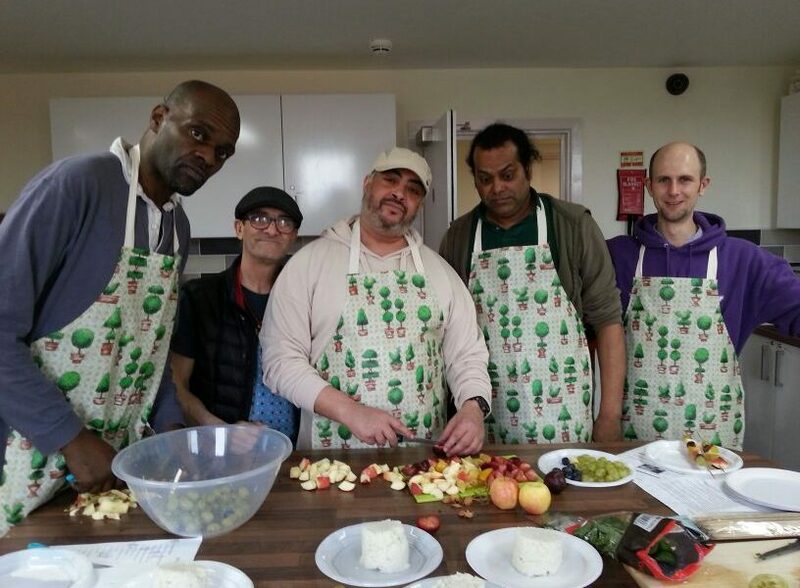 “It was a great start but we needed something a little more flexible, so we came up with our Essential Cooking course where we developed recipes for the residents – but we needed residents to lead on it, so that’s how Cooking Club came about,” explains Karina Thomas, Employment, Training and Skills Worker at YMCA Surbiton. Cooking club has been successful because it provides residents with a chance to shine and share their skills with fellow residents. It’s great for the person leading the workshop as it builds their confidence too, “Karina is really supportive. The good energy we build up stays with us throughout the day. We play music and have fun while learning,” explains Anthony. “On the whole, residents ate more and ate better before we had the kitchens, even those who can cook, but some people are saying they were eating too much. The variety and regularity and the fact you could have seconds and save that for the next day’s lunch was ensuring everyone ate adequately. I think if there was at least a free evening meal that it would get the community feeling back and make sure everyone is eating well,” says Anthony. As with any new scheme, there are teething problems, such as provision of adequate culinary equipment, cleanliness, noise in the kitchen and so on. But the hope is that these stylish kitchens will go a long way to helping people feel more independent. “The equipment in the kitchens varies, I’ve been lucky and got a good set of people on my block who generally wash up and put things back. Even though that’s the case, the non-stick pans have mostly lost their non-stick already. We could do with having a call-out to get people to donate pots and pans as there is loads of storage space in each kitchen, but most of them are empty,” says Anthony.